Have you seen the movie Into the Wild? Or read the book? I've done both. 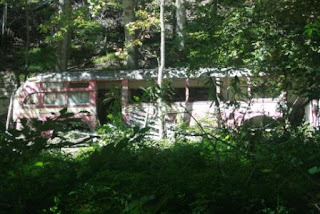 Doesn't this abandoned bus remind you of it? This bus is on the way to J.P's house, so we walk by it off and on. It's red and yellow. No one has lived there in ages. You can see old shelving and such from the road. I've always wanted to go explore it, but I don't like to trespass. To the side of the bus are the remnants of a cabin that was once attached to the bus. You can still see the old stone chimney. I have no doubt that one day someone will haul the bus off. Piece of junk that it is, I confess I will miss it. I'd be so curious to check that place out! 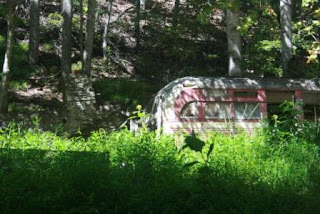 It DOES remind me of the bus from Into the Wild! Love that book and movie! ;-) My imagination is going wild too. I like to invent all sorts of stories in my daydreams.